Design of Intake and Outfall Pipeline. HDPE welding and testing of 3800 meters of 2400mm OD for the intake pipeline and 3800 Metres of 1800mm OD pipe for the outfall pipeline. Supply and installation of concrete ballast blocks. Offshore and onshore dredging and backfilling the pipeline trench. Supply and installation of sheet piling. 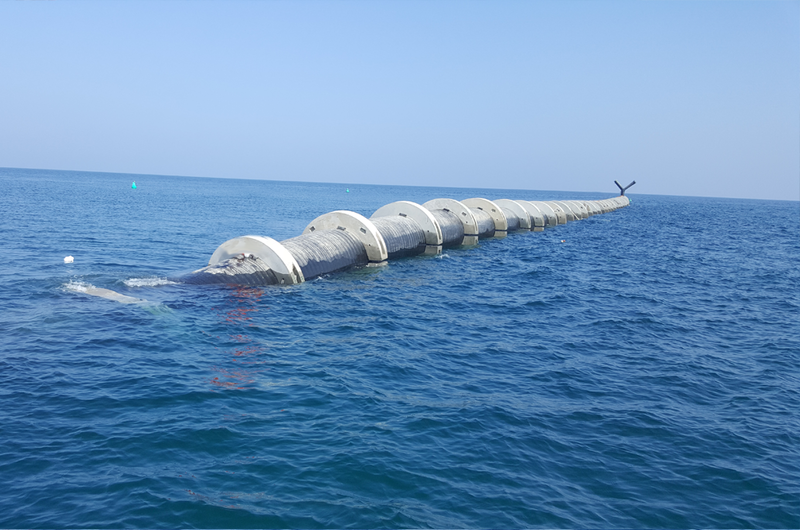 Installation of offshore and onshore HDPE pipeline. Bathymetric survey and Videographic survey. Supply and Installation of two 15 meter high, 5000mm diameter Intake Structures. Supply of Installation of outfall diffuser system. Supply and installation of Intake navigational system. Testing and commissioning of the intake and outfall pipeline.